The Committee of UNESCO defined the April 29th as the “International Dance Day” for each year. In order to celebrate it, we organized a school event in which we practically summarized some folk and modern, greek and international, dance styles to learn to overcome all cultural, political and ethnic boundaries. Dance helps to unite people in the name of peace and friendship, allowing it to speak the same language, serving Goal 3: Good Health and Well-Being and Goal 4: Quality Education as well. The Erasmus+ students of our school had the great chance to attend the educational seminar on the utilization of modern technology for a sustainable environment that was held at Egnatia Street Management Center. There we observed on monitors and got informed by members of the staff about the technological construction and control coverage of the country's largest motorway, aiming at the safe transportation of the citizens. 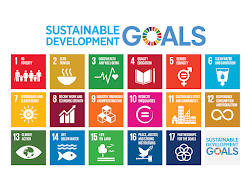 Thus, we served Goal 9: Industry, Innovation and Infrastructure, Goal 11: Sustainable Cities and Communities, Goal 4: Quality Education and Goal 17: Partnerships for the Goals. 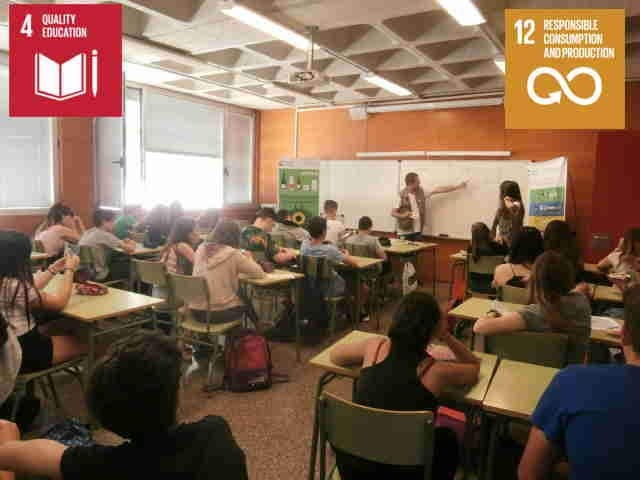 As part of our Erasmus + project “Agenda 2030: that’s our challenge!”, grade 9h students have prepared Workshops about Goal 3 “Good Health and Well Being” for primary school pupils. 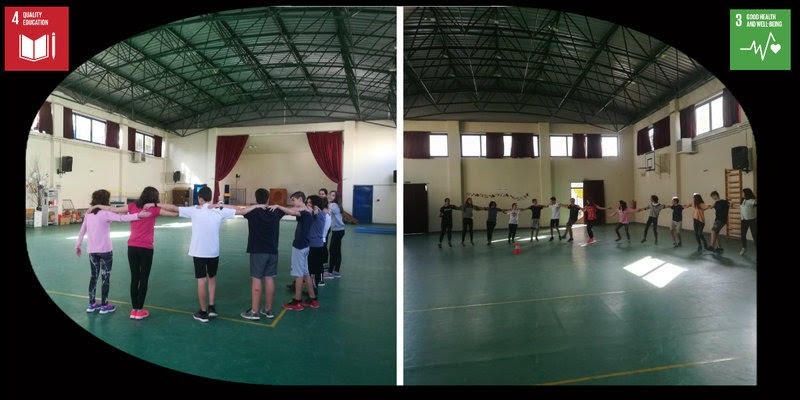 Our Biology students have prepared workshops about Healthy Food, Physical Activity and Free Time Activities. 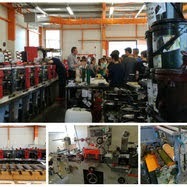 They have gone to the Primary School “CEIP Bonavista” and showed their work to primary school pupils. It has been a really good experience and an interesting activity spreading Goal 3 “Good Health and Well Being” and also an example of Goal 4 “Quality Education”. 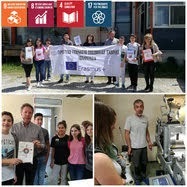 A day devoted in Goal 7: Affordable and Clean Energy and Goal 12: Responsible Consumption and Production was May 15th for the Erasmus+ students of our school. An interesting educational visit was organized at the National Hydropower Factory of Aoos Water Sources, where its executives informed us about its significant contribution to the energy sector and the human needs for electricity of our country. Thus, our activity served except Goal 7 and Goal 12, Goal 4: Quality Education and Goal 17: Partnerships for the Goals as well. AN EDUCATIONAL VISIT TO THE COMPANY D&A LABEL A.E. The Erasmus+ team made a particularly interesting educational visit to the innovative label company D&A LABEL A.E..
With the informative guided tour of the owner of the company, students had the opportunity to get to know the design and promotion of a multimodal object, the label of a product, in terms of its aesthetic and functional value. They also noticed the development of production and printing technology from the traditional to its modern digital format. 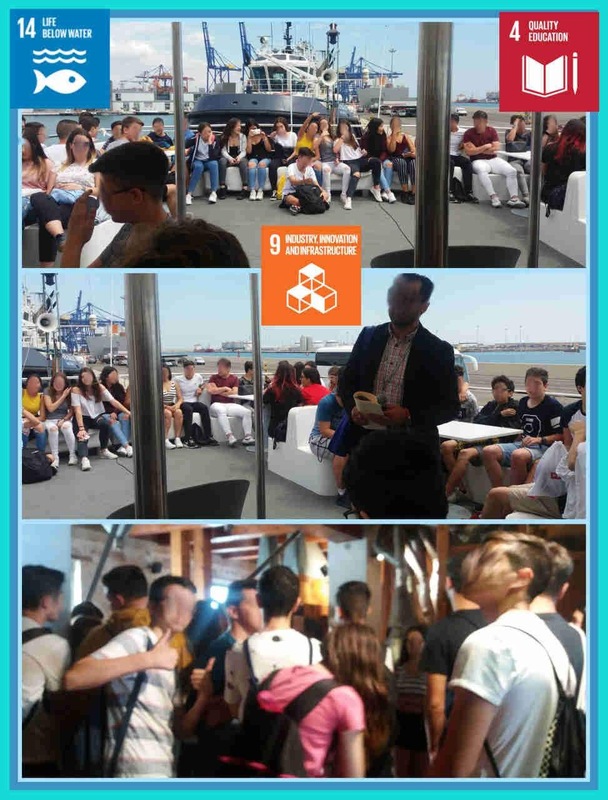 The company executives printed our own Agenda 2030 logos and offered them to us, as well as prepared a mini reception for our sake, during which the students asked questions in the form of an interview to the owner of the company. The whole process proved to be beneficial, creative and enjoyable, while at the same time it served Goal 9: Industry, Innovation and Infrastructure, Goal 8: Decent Work and Economic Growth, Goal 4: Quality Education and Goal 17: Partnerships for the Goals. 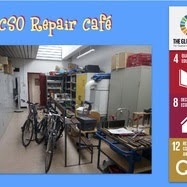 Make new from old - is the motto of the new CSO Repair Café - a garage, where students and teachers repair bikes. Instead of throwing old bikes that don’t work anymore, we try to use every piece of them and reuse them to repair other bikes. Those old bikes we get regularly from our local police station. Normally, we don’t have to pay a lot for the spare parts. And this way, we can fix bikes of our customers in a cheap and sustainable way. Of course, not all parts of old bikes can be used as spare parts. So we also have a small storage of new parts. Nevertheless, it’s much more affordable than in a normal bike shop. 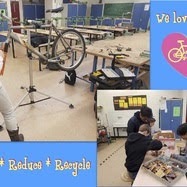 Moreover, our students learn a lot about how to maintain and repair bikes. This is pretty cool, since in summer a lot of people love driving their bike. By the way, most of the students in the Repair Café are from the „Welcome Class“, which means they just moved to Germany a few month ago and still have to learn German before visiting „regular classes“. Luckily, you don’t need a lot of language to act sustainable. We are really happy to have this working group, helping us with our bikes! 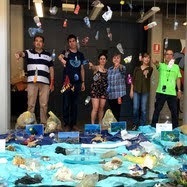 IES Clara Campoamor from Alaquàs, within the Erasmus project, and focused on the objective 14, life below water, has made an action to raise awareness of the big problem of the proliferation of plastic and its accumulation in the water of rivers and seas. Plastic takes hundreds of years to degrade. Plastic that reaches the sea implies a great danger to the life of the sea creatures. In addition, many species ingest microplastics that, through the food chain, end up at our table; these plastics are very dangerous for our health. There is only one way to avoid this terrible pollution: a dramatic reduction in the use of plastic, especially that one of a single use; and the personal engagement with a proper recycling of all the plastic material we use in our daily life. 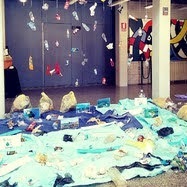 We have made a recreation that represents the ocean invaded by plastic. The trash material used has been collected in previous actions such as the cleaning of the beach of Massamagrell, the Alameda of Alaquàs and the playground of the school. 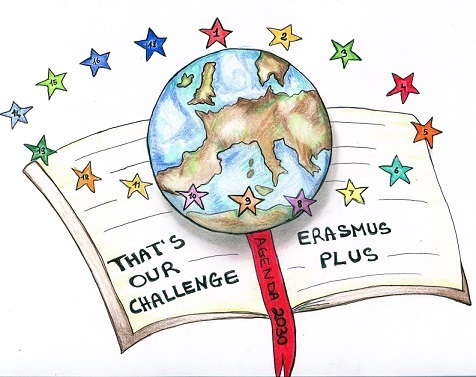 Video realized by the students of IPS "Federico II" of Enna, participants in the Erasmus KA2 Project "Agenda 2030: that's our challenge", on the occasion of the mobility in Italy (Enna) with partners from Germany, Greece, Spain, from 6 to 12 May 2018. Each World Environment Day is organized around a theme that focuses attention on a particularly pressing environmental concern. The theme for 2018, “Beat Plastic Pollution”, is a call to action for all of us to come together to combat one of the great environmental challenges of our time. This World Environment Day UN Environment is asking you, companies and civil society groups, to take a concrete action to Beat Plastic Pollution. As part of our Erasmus + project “Agenda 2030: that’s our challenge!”, grade 9h students have cleaned the school surroundings. The eco-audit can be defined as aspects on different concepts (water, electricity, recycling, mobility, consumption, noise ) related to the environment and different countries. In order to know and reduce the consumption and improvement of the environmental qualities of the world where we live, which was one of the main issues of the project, which was the 2030 agenda, it can also be said that it is a learning technique to raise awareness of the sustainable use of the previous resources. As part of our Erasmus + project “Agenda 2030: that’s our challenge!”, grade 9h students have visited the Port of Valencia. The Port Authority of Valencia (PAV), which trades under the name of VALENCIAPORT, is the public body responsible for running and managing three state-owned ports along an 80km stretch of the Mediterranean coast in Eastern Spain: Valencia, Sagunto and Gandía. Thanks to its strategic location and its dynamic area of influence, the Port of Valencia is a key player in Spain’s foreign trade. Valenciaport is Spain’s leading Mediterranean port in terms of commercial traffic, mostly containerised cargo, due to its dynamic area of influence and an extensive network connecting it to major world ports. Valenciaport is not only a key element in promoting the Valencia Region abroad, but also the maritime gateway for production and consumer goods to and from the entire Iberian Peninsula. In Valencia we generate an average of 1.4 kilograms of rubbish per person per day, and this creates an unsustainable situation in the medium and long term for the environment. 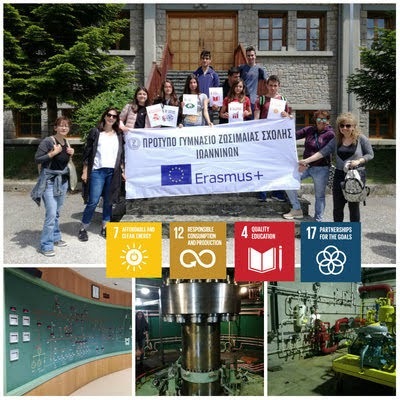 As part of our Erasmus + project “Agenda 2030: that’s our challenge!”, grade 9h students have participated in the workshop “Recycling with the five senses”. Before going to Enna, we organized a contest between our students to choose the Spanish logo. Our students worked a lot designing and drawing the logo and they were deeply involved in the activity. As you know the Italian logo won the general contest and it’s our project logo, Congratulations!! !